Oh yes, she is as sweet as she looks. 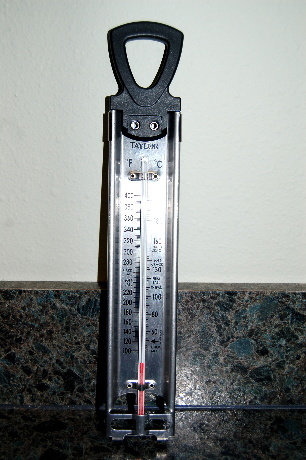 First, find a coupon for Bed, Bath, and Beyond and go buy one of these babies… a GOOD candy thermometer (jelly and fried foods, too). I like this one because it has a clip on the back for large pots, but if your liquid is shallow, like mine was, the mercury does not touch the bottom of the pot. It has two little metal legs/extensions that keep it above the bottom. I just kept it in place by putting my spoon at the bottom when I wanted to test the temp. It will cost you less than $20 with the coupon. Second, order up a cold, crisp day with low to no humidity. This is crucial. And don’t have it all hot and humid in your house, either! In heavy saucepan, pour milk, sugar, and salt. Cook on medium heat, stirring often (do not scorch) until boiling. 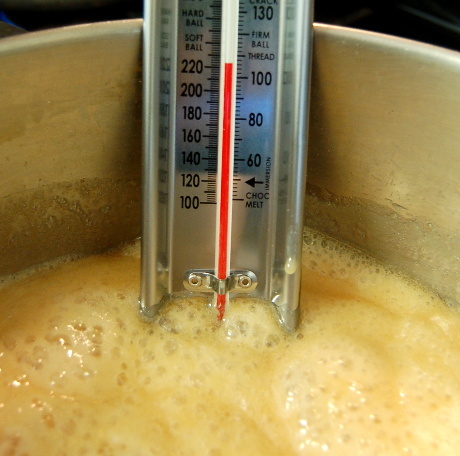 Boil on medium, stirring, until temperature on candy thermometer reaches 235, which is "soft-ball stage". To test for soft-ball stage, get a glass measuring cup with very cold water in it. Drop a bit of candy into the cup, and reach into the cup with your finger and push the candy around into a ball. If it shapes and stays, then it's ready. If not, cook a little more keeping a close eye on the temperature. DO NOT PASS 235, or they will not be the right texture and consistency. Beat with a spoon until butter is melted and mixture thickens. Spoon onto paper into two-inch patties. Let the patties cool completely before storing in airtight container in cool place. In the past, I’ve integrated the instructions with the photos, but some of you wanted the recipe all in one place). So, since it’s the holidays, I thought I would make it easy for you. For those of you who liked it better the other way, here you go . 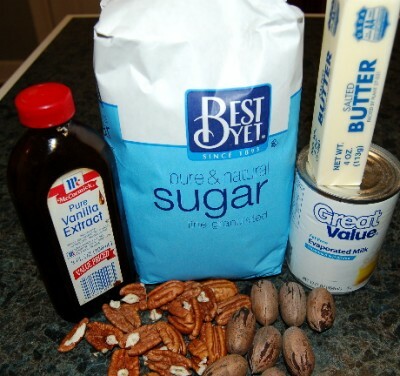 . .
Do not use a food processor for your pecans, as they will be like meal and make the patty mushy. I pulse half of them in the processor, and then break the other half into big pieces with my fingers. Works fine. Here, the mixture is boiling on medium, as it should, and slowly reaching the 235 degree mark. This is a slow process, which you do not want to speed up because you will scorch the mixture, and then you’ll have to throw it out. It’s time to test for soft-ball stage in a cup of cold water. This is what the mixture looks like after stirring in the butter, pecans, and vanilla and it’s just about ready to spoon onto paper. These have just been spooned onto the paper and will sit there for about an hour to cool. DO NOT USE A METAL PAN, because they will not set up properly. 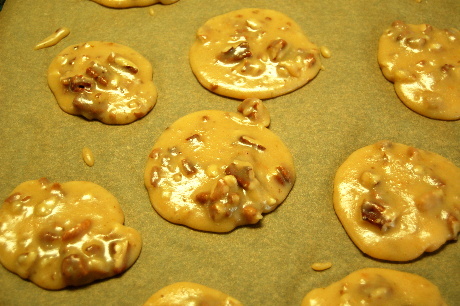 And there you have my version of what my Bayou Mother-in-Law calls “pecan candy” and New Orleans calls “pecan pralines”. I decided, that I would tweak recipes, make it my own, and call it “Pecan Pattie”. So, happy holidays everyone. If you’re looking for a nice gift that won’t break the bank, make up a batch of these and give each person a dozen. There you have it . . . . four people checked off the holiday gift list–(teachers love them!). I say 2 tablespoons of vanilla. I love pralines. That’s sure something I won’t find around here. Hm. How could I ship with them going to bits? Thats what those cute little round metal cans ya grandma always had sitting around. I think Michael’s sells them. A ziplock in a box full of crumbled newspaper worked fine when I was in the service. Sure starting to look like Christmas! BTW if you can save some crumbs, put them on top of a pumpkin or sweet potato pie just before ya serve it ……. Mmmmmmm.. Popcorn. It will cushion them and absorb any moisture during shipping. Well, isn’t that an interesting tidbit? Thanks for sharing, Cuz!!! Probably 2 tablespoons. I love these. Can you just send me a box? Or come to my kitchen and give lessons? Lessons for this recipe will be included in the Winter Quarter Session of Becoming a Bayou Woman at Camp Dularge 2011 !!!! When will this winter session be? Will you have a spring session? Yes, it will be in April! I am thinking positive! I bet you would need to have those good Camp “D” pecans to make ’em that good too. Those pecans no doubt would make castor oil taste like ice cream. Well maybe not………. 1/2 t. Rest of you guys don’t like pecans, do you? I got 3/4 a shoebox of those pecans. Yummy. BTW…….Sat I made Fruit Cakes. You never did get yours last year (Hubby took it from the freezer and ate it about a month ago) I put another one in the freezer with your name on it. Today was spent making “Martha Washington Balls”. My Blood Glucose has risen just smelling all the sugar! Steffi, most of my pecans are too big to leave hole, so I just break them. I love big pieces of pecan in my praline, so I might consider doing away with pulsing any of them at all. And I just got through telling Granny Sue’s Blog last night that I never get fruitcake and don’t know how to make them. I didn’t want to ask, but man, I was sure hoping you would remember the fruitcake! I really, really want some! I might be making a run over your way soon. If so, I’ll let you know. My mother used to make Martha Washington’s, too. Heather took over that tradition a few years back, but I’m not sure she’s kept it up. Hey, do you want my Fruit Cake recipe or do you want to try it first? It’s a moist cake without the help of whiskey,(YUK… can’t even stand the smell). Oh, I want the CAKE. That’s YOUR tradition!!! 1/4 tsp. I love these but, don’t have the teeth to eat them anymore. Is it because of the pecans? Because the candy part melts in your mouth–literally. Yep! It’s the pecans and I have 3 trees in my yard and only about 3 pecans on all of them this year! But, I have about 6-10 gallons shelled and in the freezers from last year. six to ten gallons? Oh my goodness. What will you make with them? What is it they say about pecan trees? Every other year???? Actually, we have a bumper crop about every 3 years and a so-so crop every couple of years. I make all sorts of stuff with them. I grind them to dredge fish fillets and pork chops in them for baking, make pies, cookies, candy and top casseroles with some. And then, I give a bunch to friends and relatives. I sent a bulging, gallon ziplock bag home with my daughter for her holiday baking and one to my son for his. Those look yummy! I say 1 teaspoon of vanilla. I’d say a teaspoon and a half. I found a recipe a couple of years ago that used cook and serve buttercotch pudding that isn’t quite traditional in texture but works pretty well on a humid day if your pinched for time. 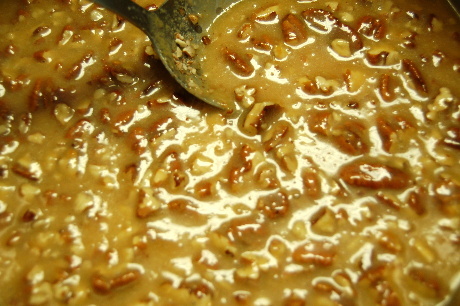 Today I’m going to make pecan caramels, I’ll have to bring you a sample. Okey dokey, so you tomorrow! I go with the 1 tsp. as that is what most recipes call for. Those look and sound really good. I may have to try that this week-end. I am going to say 2 teaspoons! Some. Soul food cookin all the way! Jambalaya on a snowy night before ice fishing. Almost perfect. Pecan pancakes in am I think. Some ain’t a guess. Splash is a guess. Aww man….I want to make these NOW!! How long do we have to wait for the edit???? Yessss…….thanks….I can’t wait to make them!! A little bit of Louisiana for my Texas neighbors!! Only one person guessed the right amount of vanilla, so that person wins without a random drawing. The right amount is 1/2 teaspoon!!! So do I get Patty the fishing artist or couple pecks of pecans in a big box of kumquats or…. Spent a long time between 4is and 20 making fudge, rice crispy treats, popcorn, etc etc etc. I have never had any luck making pralines. I tried your recipe last night. Oh my goodness they were delish ! Thanks. Ding ding ding ding! One success story!!! And one satisfied customer!! Well, congrats Sheryl! I’m so glad they worked for you . . . and it was a bit humid here, too. Where are you? I wouldn’t have had a clue! Are they similiar to pecan brittle? Kinda what they look like: little dabs of brittle. I’ve no pecan source anymore. The family farm is no longer ours. You have to have trees, know someone who has trees or bite the bullet and buy them at the store. Pralines (pronounced prawlean not praylean in S. La. )is nothing like Brittle. When cooked properly, they have a soft, creamy texture. D@*# I just drooled on my Laptop! Oh, oops, I see you just replied to Bug. Too bad. She’ll hear it twice! It’s sad you don’t have trees anymore. I was so excited when I bought Camp Dularge and saw the pecan trees and fig tree. They are not hard like brittle. They are soft and melt in the mouth; not chewy like caramel, either. That was a fig tree? Neat I was wondering. About 5 satsumas back there you’d be set. Yes, it was losing its leaves. They look really sad in the winter! Okay, privacy fence across the back to keep out Lawn Mower Man and yard apes from back-door neighbor. Then 4 satsumas and 1 kumquat in front of back fence. Sound good? I still have a gift for you. Don’t you even want to know what it is? Email your mailing address again so I can ship this package. Gonna cost me a small fortune . . . .
Good I’ll come back after I get off Terrebonne double secret probation. Tip for anyone visiting down there. Stay off Klondike Road. It’s not faster any where even if shorter. Speed kills. Uh how, how BIG was the ticket, and how FAST were you going? I have the teeth to eat them this year!! 🙂 And one of my trees is loaded, one has a small crop and the one that tastes the best with a shell you need a sledge hammer for, had about 4 clusters of 3-5 pecans each on the entire tree!! We water them with soaker hoses for 24 hours, once a month during the dry months and get rewarded with a big crop usually. I have about 10-12 gallons picked up and bagged on the back porch for my mom to shell. Mom has to have something to do to keep her from being outside where she falls all the time. But, she loves to shell pecans. I used to let anyone who wanted them pick them up after I had gathered what I needed until she got in such frail health and now she asks me to do it for her. I seldom get the ones she shells since I keep a enough for me here. She gives them by the quart and gallon bag to her friends. Her doctor gets them for every holiday and the neighbors, her favorite bank teller and nearly anyone else who wants some and asks for them. There are some who buy them from her too. I still have a couple of gallons here I have to crack and pick out for my freezer. And the yard is still pretty much covered. Wish you lived near, she would swap you pecans for fresh fish any day of the week. Oh, dear, and I would GLADLY swap her some fresh trout and red fish filets for some of her good shelled pecans. Talk about make some great pecan candy and pecan pies! And I’d put it some in my chocolate fudge, too! Please tell her I asked about her and wished her a very merry Christmas!!! Dear Mrs. Scrooge, I need to try to make some pies tomorrow for a Christmas party Saturday. Hey, when your kids pout and say, “Oh, if I only had one of Mom’s sweet potato pies for my party, it would be complete!” Yeah, butter me up!! Ok, so let’s get out of this frump, but I know it’s the “warm” weather we’ve been having that does not put us in the holiday mood. So, let’s think cooler temps together! Just recived new post notice today. sorry I am late. I love pecan anything. Thanks for the recipe. You can bet I will be making these. I hope they turn out well, Bill. It really does depend on cooking to right state and lack of humidity!!! I am definitely making these TONIGHT!!!! lOOKS AWESOME. Well, take it easy on the sugar, there my friend!!!!! Gotta watch those levels!! But they are so good . . . . . I hope you enjoy making them. I know you’re going to take some to work!!! I made those last week and they were perfect! I’ve tried the last few years but the humidity here is usually too high for those. I tried one batch with vanilla and one batch with rum flavor instead of vanilla. I liked the last one better. Have you tried pecan pie bark? Oh great! Will have to try the rum flavoring!!! Was looking at it in the grocery store earlier today, wondering if that would be good. And here you are with the answer!!! Pecan pie bark??? Where is the recipe??? Preheat oven to 325 degrees. Lay your graham crackers tightly across a lightly greased rimmed baking sheet. Trim crackers to fit in the sides of the pan if needed. Set aside. 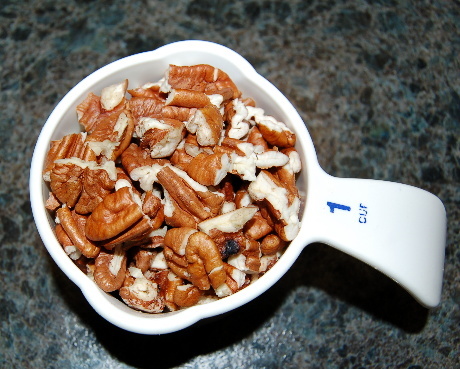 In a saucepan, bring the butter, sugar and pecans to a boil over medium heat for 3 minutes, stirring constantly. Carefully and evenly pour boiled mixture over graham crackers, spreading pecans around evenly. Immediately put the baking pan into the oven and bake for 8 minutes. Allow graham crackers to cool completely and break into pieces. Store in an airtight container. I usually double the recipe. Thank you so much. These look easy and yummy too. Mrs. Coach – we need the recipe for pecan pie bark, please!!!!! Too much sugar for me just now, and most of my friends and relatives are either diabetic or dieting. Sigh. But the recipe is safely tucked in my file, and when I get to the point where I’ve met my little “goal,” I intend to indulge in some sweetness. These will be on the list! Hi Linda. I read your latest post, but was on my smart phone, which I seldom get online on it, and didn’t take the time to leave a comment. I really enjoyed it, and remembered the milk-jug ring lyrics were my favorite! Such genius in creativity! Merry Christmas to you and Miss Dixie! Hello, Foamheart. This is a test. I’m typing this in Word and will now attempt to copy and paste it into a comment on the blog. Here we go to see if this works. Guess what? It worked, so I have no clue what you were or weren’t doing!!! When you say your prayers, please pray for a peaceful passing for our cyber friend, Blufloyd. He possibly only has a few more days on this earth. Thank you for all the private messages asking about his condition. I have spoken to him, but they are keeping him sedated because of the pain. May God have mercy and grant him a peaceful passing. Amen. And one final Merry Christmas to the best freshwater fisherman I’ve ever known. Merry Christmas, Steve. Howdee Brian, this a good place to learn those culinary cajun delights from the old days and a few good folks along the way. AHA! So you know our new friend, Brian? Y’all must frequent some of the same cool cooking forums, right? Well, I’m glad he’s here, too! Welcome to this bayou blog, Brian, and so glad to have you here! Please take your time, and browse around. Comments and suggestions welcome! Merry Christmas! Howdy howdy Kev. And thank you Wendy. I’ve Been lurking for a while. Lots of good stuff here. You’ve made a real comfortable spot on the internet. And yes I do know Kevin. He’s been extremely helpful and awesome support with bringing my Creole and Deep Southern cooking to a higher level. Ask him about his new grinder! 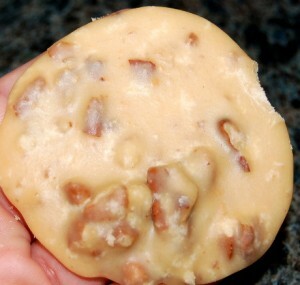 Anyone on here ever hear of trash can fudge or perhaps coffee can fudge? It is supposed to be soft enough to just dip your fingers/spoon into and eat. I have heard of it but I’ve never seen, made, nor tasted it! Yes I have heard of it, my Mom talked about making fudge in college on the radiator. They didn’t have mini refridgerators, heck you were lucky to have an icebox in the house. But it was fudge and they would pass around the wooden spoon till the fingers became involved. I have some of her old recipes, even the one she said she and her sister would sometimes make after school when they were lucky enough to have the sweets. But I checked and all say bring to a boil. I waited at least till Christmas Eve. I want to wish everyone here a save and happy holiday season, and a very Merry Christmas. I am sure you’ve all been good too! I have a busy day tomorrow so a very, safe, happy and fulfilling Christmas to everyone.